Take this rare opportunity to join our full-day photo expedition workshop that will be lead and instructed by professional photographer, Mr. Brian Bravo. All expenses including transportation, food, and snacks are all taken care of. Hacienda San Benito is a 22-hectare development in Lipa, Batangas at the foot of Mt. Malarayat. Take photos of magnificent landscapes, Cascading Ponds, Koi lagoons, Farm animals such as chickens, turkeys, ostriches, goats, sheep, cows and carabaos; a coffee plantation, a grape vineyard, a pineapple plantation; and a garden of flowers and ornamental plants. 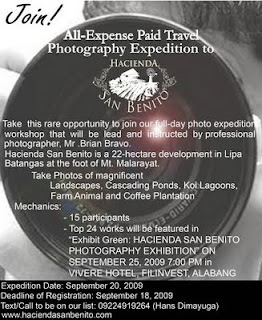 Expedition Date: SEPTEMBER 20, 2009, Sunday.